Devart company decided to publish roadmap of dbForge for MySQL line to help you understand the future product development. This roadmad encompasses two products: dbForge Studio for MySQL and dbForge Fusion for MySQL. Below is the chronologically ordered list of features we plan to implement in the near future. Note that the list is not frozen and some items can be subject to change. 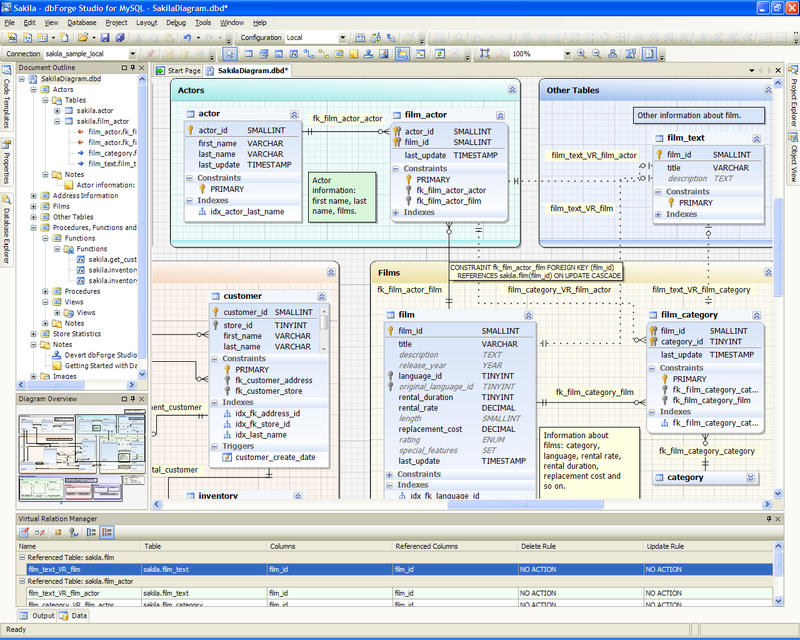 Database diagram is a new type of document that represents visual layout of the database. It will implement online (directly to database) database object creation and modification. Here is a screenshot of this feature (currently under development). This feature will allow users to import data to database from most used file formats such as CSV, Excel, MS Access and ODBC. This feature will allow database administrators to setup daily database backups by means of MySQL server. This feature will allow users to create custom data reports using graphical report builder, save, load, execute and print them. These are the main features that will be developed in the future releases of dbForge for MySQL product line. We are looking for your comments and suggestions about future product functionality. Will you be able to provide the facility to import directly from a .DBF file (in addition to CSV, Excel, MS Access and ODBC) ? Import from .dbf file is also included to the list.